Texas providers: Get the latest in-depth PASRR Specialized Services information, directly from DADS. 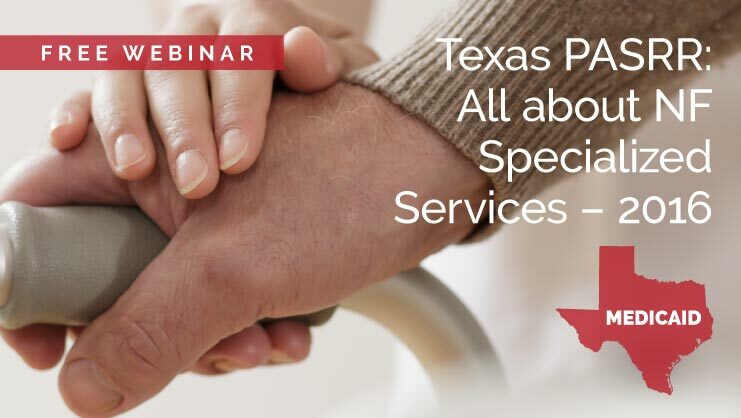 On Aug. 23, SimpleLTC and DADS provided a free webinar to update Texas nursing facilities (NFs) on the latest requirements for Texas PASRR Specialized Services as they relate to the nursing facility. Watch the webinar on-demand to learn the rules and requirements of PASRR Specialized Services, the processes and required forms for prior authorization, how to bill for Specialized Services, and much more. This is your chance to get the latest Texas PASRR Specialized Services information for 2016, directly from the Texas Department of Aging and Disability Services. The recorded webinar and handouts are available on our Texas PASRR resources page. Click below and look for “Texas PASRR: All about NF Specialized Services”. This webinar is presented free of charge to Texas long-term care providers, courtesy of SimpleLTC and DADS. There will be no sales pitch involved. The content is applicable to all Texas SNFs and personnel responsible for Texas Medicaid accuracy and DADS compliance. do any of simple in-services offer ceu, if so how do i go about getting the cert., hope they do!!!! Unfortunately we are not able to offer CEUs for our training webinars. where are the handouts that they are referring to on the webinar?